What can I say. Haven't you heard about it?? The world's largest conservatory, in one of the world's most unusual 'garden' settings. It is not what most people would imagine Eden to be, the dusty bowl of a worked out chalk pit, but the idea of what you find inside is wonderful. 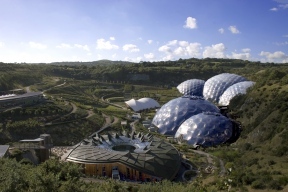 The biomes, huge bubbles (yes, the architecture was inspired by a bubble in a washing up bowl!) house a fabulous collection of plants from around the globe. The Humid Tropics Biome is high enough for rainforest trees to grow to their full height, and paths and walkways enable you to walk from flc to canopy cover, the mist sprays and roaring water] adding to the atmosphere. The Warm Temperate Bio: has many plants to be seen growing in meditteranean type climate, a group of plai becoming very relevant to the UK in these days climate change. The centres are informative and educate the visitor in a subtle and entertaining way.